Before I get into discussing menu plans, I want to remind you all of my giveaway! Thanks to Caitlin at CSN Stores, I'm able to giveaway a $40 gift certificate to use at any of their 200+ websites! You can't win it if you don't enter! So, head over to this post for the details on how to enter! Okay, so back to our regularly scheduled menu plan! Last week was another failed week. A lot of that failure was due to the hot, hot weather. We really didn't have much of an appetite for big meals. That was great for me since I really didn't want to cook much. We pretty much ate lots of leftovers, sandwiches or grilled hot dogs and honestly, we were really okay with that. No complaints from me or the hubs! 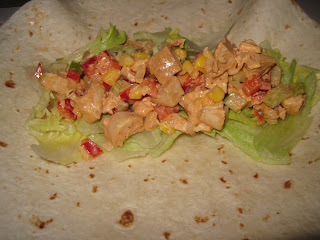 One of the meals I put together was a Barbecue Chicken Salad that we wrapped up in tortillas. 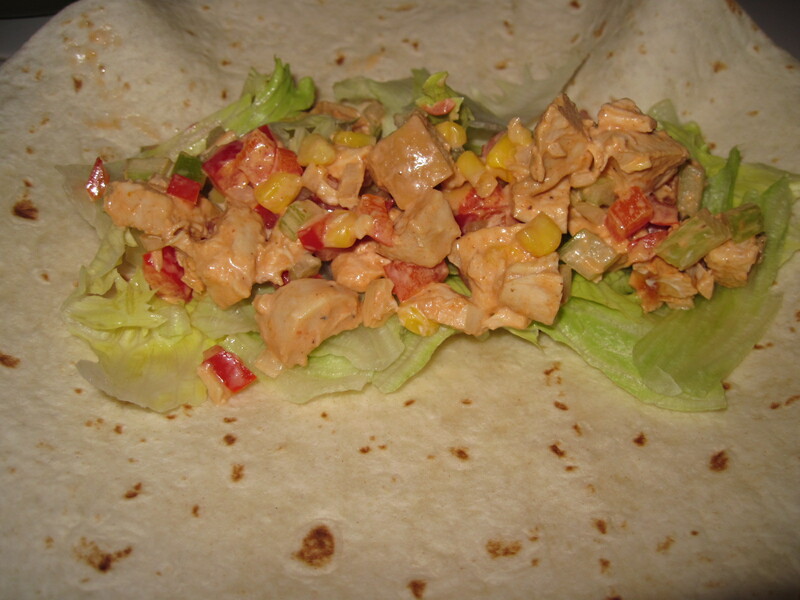 I made the chicken salad for lunch when a friend came to visit and Joe and I ate the leftovers that night. A few weeks ago, I posted about how I was struggling to stick with my menu plans and after reading some very nice comments from other menu planners, I was able to not let last week's failure bother me. 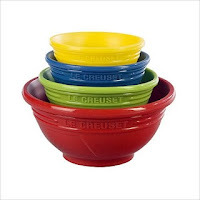 This week, I am planning a very easy menu since I have a feeling that Grace will want to spend a lot of time playing with her water table or splashing in her little plastic pool. We had company for dinner last night and have lots of leftovers, so I will be incorporating those into our meals for this week. For nights that we aren't eating easy leftovers, we'll either grill or use the crock pot. Keeping it as simple as possible. I didn't assign days to the meals. Just having some meal ideas seems to help me more. If I assign meals to certain days, I start to get stressed if I mix it up. It makes me feel as if my entire plan is falling apart. It must be my OCD showing through! I'm also going to write down the menu ideas and stick it to the fridge like my friend Lisa does. Sometimes I forget what I planned and can't manage to get online to check my latest Menu Plan Monday post. Having it posted on the fridge will help me a lot....I hope. Also, I know I have had cranberry pork on my menu plan several times in the past month or so and I never get around to making it. It will be made and the recipe posted this week. I have the pork tenderloin in the kitchen freezer and after I hit publish, I will take it out of the freezer and transfer it to the fridge to thaw. After that, I'll be outside sweating enjoying the summer weather with Grace. I hope everyone has a great week! For more menu planning inspiration, visit Menu Plan Monday! I'm struggling with the summertime menu, too. My dh isn't into sandwiches for dinner, though it would be nice to have cold sandwiches on the hot days. The cranberry pork sounds good. I have a lot of cranberries in the freezer and a huge piece of pork that I bought at Costco. looks like a great week. I went off my menu plan last week too with it being so hot! Kelee here. Great news! You won the yellow Mccoy giveaway! And, thank-you for subscribing, my friend!